Graves Motorsports Rev3 2015-2019 Yamaha R1 Full Titanium Exhaust System with carbon fiber 200mm silencer. GMS Exhaust systems are designed for the elite rider seeking top of the line performance, fit, finish and value. 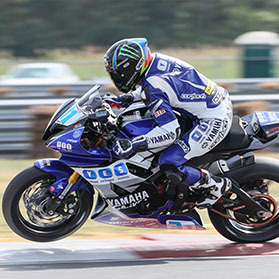 This R1 exhaust system was developed using the same technology that has powered the Monster Energy Graves Yamaha team to 8 AMA / MotoAmerica Superbike championships and numerous 600 championships! This product is intended for closed course competition use only. Use of this product for any other purpose is strictly prohibited. Combined with Graves’ exclusive flash tune map this system produces huge mid range and top horsepower gains. This tune also removes any computer error codes the bike will have when installing performance exhausts. New 200mm Diamond Shaped Silencer Design with tapered deep draw entrance and exit caps designed to match the R1's body line.